"308- Glen Iris, Residence of Wm. P. Letchworth, Portage, N.Y."
This peaceful scene shows a visitor in a boat on Mr. Letchworth's manmade "lake". 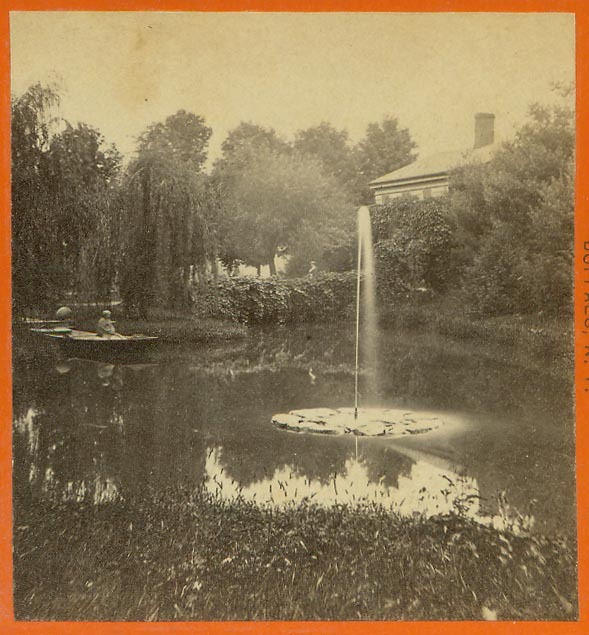 The pond is fed by the manmade fountain shown in the center right of the image. This fountain was designed by landscape architect William Webster (see Ornamental Farm) and is fed by springs on the hillside to the west. To this day the fountain is gravity fed - the pressure of the water fed through the pipe creates the "geyser". Also note the stone base to the fountain which is no longer visible at the Park. At the far end you can see the rustic bridge carrying the road to the Glen Iris, visible through the trees. For more information see the Glimpse of the Glen Iris.